A driving range has just been opened on the front lawn (that's some lawn, eh) of this 5 star hotel, located in the centre of Cork City. Measuring a mere two acres, guests can enjoy the range using specially produced lightweight practice balls. There are other golfer amenities but the range will undoubtedly prove attractive to business guests looking to relieve some stress at the day's end, as well as high-end golfers who enjoy lapping up 5 star luxury. From here it is easy to reach the prestigious venuesof Fota Island, Cork Golf Club and Old Head of Kinsale. Not only that, but every resident is encouraged to give golf a try as all of its 88 bedrooms include a putter (hidden between the kettle and the trouser press, perhaps). Visit the website here. 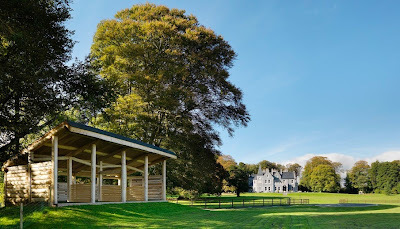 Mount Falcon, outside Ballina, Co. Mayo, is a very special 4 star hotel that has its ethos firmly embedded in the rural beauty of Ireland - it dates back to the 1870s and stretches over 100 acres of woodland on the banks of the River Moy. 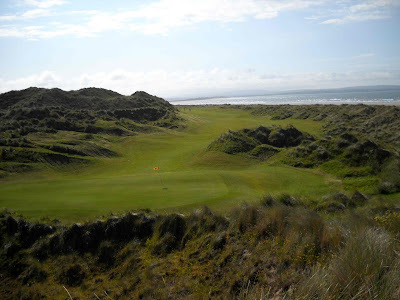 Fishing comes high on its list of activities, but golf is also a priority with 12 golf courses (including some of my favourites) within an hour's drive. The log cabin that forms part of the Mount Falcon Driving Range. The hotel now boasts a 9-bay public driving range (4 housed indoor in a Canadian log cabin and 5 outdoor) which was opened earlier this year. There's a designated building for club drying, storage and battery charging, and the hotel is very much a 'full service' provider, arranging airport pick-ups and transfers to and from golf courses. Early breakfast and packed lunches are also available. It helps that Alan Maloney, the hotel's owner, has a bit of a thing for golf so, after a practice session or a day on the links, you might find yourself talking golf in the bar for much of the night. In 2011, Mount Falcon won the IGTOA's (Ireland Golf Tour Operator Association) Boutique Golf Hotel of the Year Award. Visit the website here. Views back up the 16th at Enniscrone - not far from Mount Falcon. 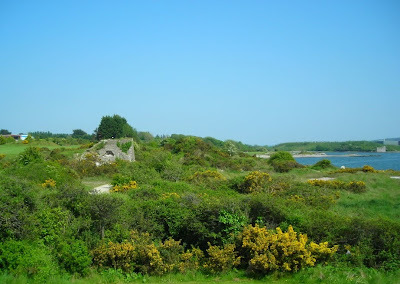 The Cliff House Hotel is a few miles west of Youghal, in Ardmore. It is a 5 star boutique hotel, right on the ocean's edge... which makes its driving bay one of the most intriguing around. Situated in the gardens, golfers can hit environmentally-friendly golf balls towards a floating pontoon in Ardmore Bay. It's a unique touch and for once you'll get a little buzz when the ball splashes down. The hotel's location, food and spa make it a very popular destination but golfers might feel a bit bereft as the golf courses in the area, while perfectly solid, are not exactly top drawer stuff. West Waterford is the pick of the bunch. Elsewhere, Kelly's Resort in Rosslare has a crazy-golf-course - it probably hasn't changed much since I played it almost 40 years ago - and I'm sure that there are other hotels that throw in some golfing ingenuity, such as practice greens, a couple of holes stretched across the grounds or even just a driving net... if you know of any, please drop me a line. Picking an Irish place for visit is the most happy moment of all time, the beauty of nature and nice people makes me feel good. Golfing is no doubt is one of my favorite sport but managing time for some action is really hard sometimes. Post is looking great! thanks for sharing.